Gutsy is approaching the beta release and the Ubuntu compiz team feels like our packages from the 0.6.0 upstream branch are in good shape for it! We spend a couple of days in London last week to work on high priority problems and got a great deal of work done. A big kudos to the wonderful compiz-fusion upstream community that was a great help (both the people who attended the sprint directly and the ones who supported us via irc). Judging from the bug reports we get, we feel we are in good shape for beta. 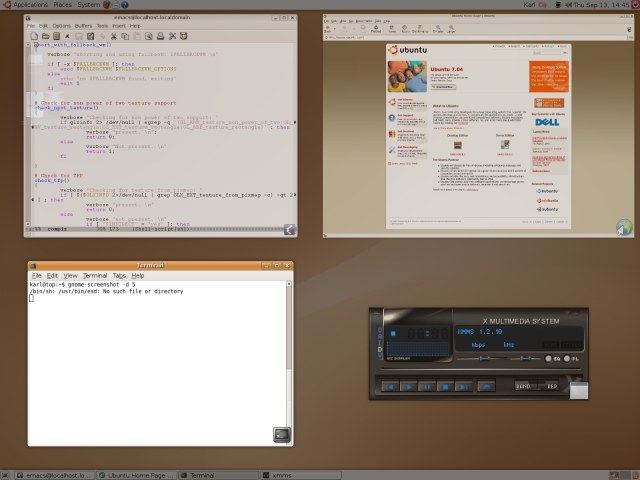 But not everybody reports bugs so I would like to get a better idea on how well compiz works in the real world. Please fill in https://wiki.ubuntu.com/CompizFeedback if it works or if it does not work for you. The technical board voted for compiz by default for Ubuntu 7.10! This is a very exciting step. Compiz (and the fusion plugins) will be enabled for new installs on all hardware that supports it. A lot of work was put into making this happen, a special thanks goes to the great compiz and compiz-fusion community. We now need the help of the ubuntu community to find bugs and issue with this new default. Please test current gutsy livecd images. If you run gutsy already, please enable compiz (System/Preferences/Appearance/Desktop Effects) and report any problem to the launchpad bug tracker. We will have to disable it on some hardware because its either too slow or the drivers are not yet good enough to make it a pleasant experience. Real world testing is essential to figure out which ones. It is important that we get as much test coverage as possible on a wide variety of hardware at this stage of development. Please help and report bugs! You are currently browsing the Michael Vogt's blog blog archives for September, 2007.